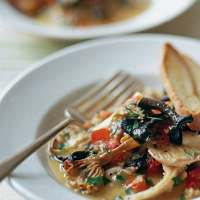 The mushrooms for this dish can be prepared a day in advance. Don’t wash them for longer than 10–15 seconds, though – any more soaking and the mushrooms will absorb the water, which will destroy both taste and texture. Preheat the oven to 170°C/gas 3. Boil the wine in a small saucepan for 1–2 minutes until reduced by half; set aside. Brush anything reminiscent of the forest off the mushrooms, wash them briefly in plenty of water, then pat dry with a clean tea towel. Halve or quarter the mushrooms so the pieces are the same size. Bake the bread for 10 minutes in the oven until lightly golden brown. Turn the oven off; rub each slice with the clove of peeled garlic, then set aside. In a large frying pan, on a medium heat, soften the chopped shallots in 1 tbsp butter for 2 minutes. Increase to full heat, then add the puréed garlic and all the wild mushrooms apart from the black trompettes; if you add these too early, they will discolour the sauce. Season, add the wine and stir delicately. Cover with a lid and cook for a further 30 seconds. Add the lemon juice and stir in the remaining butter. Finally, add the black trompettes (if using), half the chopped parsley and the diced tomatoes; cook for a further 10–30 seconds. Sprinkle with the remaining parsley and serve with the croutons in soup plates or a large bowl. A dark, gutsy red from France’s wild southwest will strike just the right forest note with the wild mushrooms and garlic. This recipe was first published in July 2008.